Why Is Mercury, a Metal, Liquid at Room Temperature? Ever wonder why mercury, a metal, is liquid at room temperature – the only metal to be have so? I’m sure most of us have seen mercury, have realized it is a metal, yet one man followed up to find the answer. 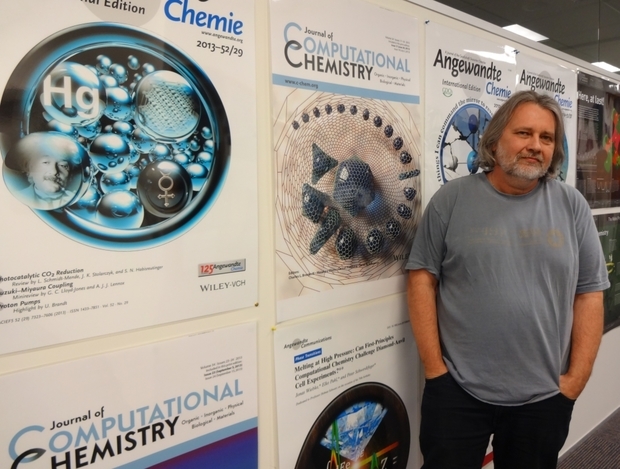 His name is Peter Schwerdtfeger, and he won the Rutherford Medal this year, New Zealand’s highest science prize. Schwerdtfeger is on the faculty of Auckland’s Massey University (where my wife spoke on Friday). According to Schwerdtfeger, the reason gold is golden in color and mercury is liquid has to do with quantum effects. According to Schwerdtfeger: “For a very long time people believed that relativistic effects are of no importance to chemical systems because from Einstein’s special relativity we know that if particles reach very high velocities close to the velocity of light, then special relativity becomes important. People thought that for electrons in the valence shell, which are important for doing all the chemistry but move rather slowly, that you wouldn’t expect that relativity effects would be important.” But they are. Hard for me to understand and explain in a short blog what those special relatively effects are – enough to understand that Schwerdtfeger took on the physics establishment and proved that relativity is important even for electrons travelling very slowly. It took him years to get his breakthrough paper published. When he submitted the first, the reviewer told him there had to be a mistake – because it violated what was known at the time. Eventually it was published. There are several lessons here. First, if you are a doctoral student, pick a really big touch hairy hard question to research. I myself failed to do this and regret it ever since. Second, Schwerdtfeger says: ‘If you only invest in commercial science and completely neglect basic science you probably get neither of them.” Under the current Conservative government of PM John Key, government spending in New Zealand has been slashed to the bone, university lecturers have been fired, research grants cut back. Key is vastly unpopular here, but democracy’s wheels grind slowly. Until the wheel of democracy comes around, great damage will have been done to New Zealand’s universities. Those strange luminous ‘fishing lines’ in the picture are actually — strange luminous fishing lines. 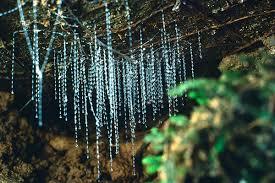 They are created by glow-worms, weird creatures that live clinging to the roof of the Waitomo Cave, here in New Zealand. Evolution has taught these creatures to attract their food – bugs and mosquitos that breed in the river below, that runs through the cave — by fluorescent luminosity. When the lights are turned out in the cave, there is a spectacular sight – the entire ceiling glows, with a thousand points of light, just like the heavens on a clear starry night. And the older the glow-worm, the more luminous it is. The ‘butterfly’ form lives only a day or two, and has no mouth (because it has no need to feed, its only job is to mate, reproduce, and die), but the worms live quite long. And it dangles those strange strings down, to trap its food. Evolution has created creatures that are superbly adapted to every possible environment – deep under the sea, in steam vents, and here, in deep dark caves. Give Nature enough time, and it will solve any problem. I think we can learn from these tiny glow-worms. They emerged because Nature tried experiments. By accident, one weird glow-worm was luminescent. His friends all laughed at him/her. Hey, look at Wormie there, he glows. Let’s sing him a song– Glow little glow-worm, glimmer, glimmer…. But Wormie caught loads and loads of bugs, enough to reproduce successfully. And then Wormie’s kids, too, glowed…and down the generations. This too is how humanity can crack its toughest problems. Have enough creative people running around trying weird things, trying to ‘glow’, with bright ideas – and some of them may work. Some of them may one day light up the world. My wife Sharona and I are in New Zealand, on the very last leg of a world tour that has taken us around the world, from Brazil, to Boston, France, Singapore, Vietnam, Guangzhou and Shantou China, Hong Kong and now Auckland. It’s been a great adventure – we combined touring with lecturing, teaching, research and meeting the local Jewish communities on the Sabbath. Here, I visited GridAKL, a local incubator located near Auckland Harbor, in the Wynyard Quarter, and designed to foster technological entrepreneurship. I met with Eva Perrone, whose title is “activation manager” and she showed me the facility. The first floor is an open ‘events’ area, where companies outside and inside the incubator can stage workshops, meetings, etc. The second floor is the incubator, designed as open space, with quiet areas, kitchens, and lots and lots of light. Some of the entrepreneurs in GridAKL are from Aukland University of Technology (AUT), a fine university with entrepreneurial spirit. Despite New Zealand’s remoteness from the world, it is super-connected, with fast broadband. 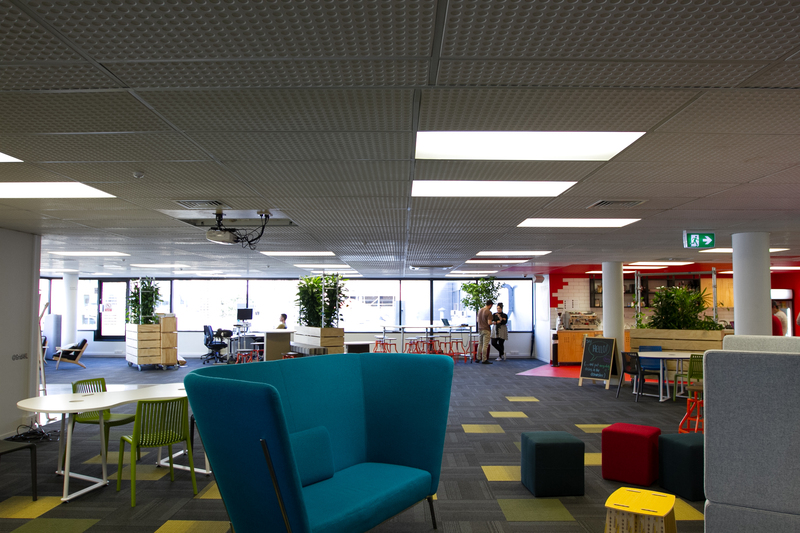 Many of the startups in GridAKL are IT and software startups. New Zealand itself makes a living from tourism and dairy and food exports, but is eager to expand its portfolio and build a startup culture. In our travels, from Brazil to Vietnam, to China, Hong Kong, and now New Zealand, we have seen young people eager to start businesses and change the world. This is an extremely positive trend. It is also one that should accelerate the heartbeat of an entrepreneur and pump a few grams of adrenaline. Today if you have a great idea, chances are so does someone else, who could be anywhere in the world, including places you might not think of. Here in New Zealand, we saw an amazing site – the glow-worm cave (see my next blog), where Nature and Darwinian evolution has created incredible worms that glow in the dark inside the cave ceiling, and actually create tiny long ‘fishing lines’ that they use to catch their food (mosquitos and bugs). The ‘glow’ attracts the bugs. Evolution has produced amazing things, as species compete to survive. Entrepreneurship can do the same. The fierce competition among ideas and resources can generate truly wonderful new creative things that create value for the world and literally, produce something from nothing. And all it takes is a few young people (or young in spirit), some open spaces, accessible food (this is the key to a great incubator, Eva Perrone assured me, and I told her about Google’s executive restaurants in their Mountainview, CA campus), strong networking and a great university. Marathon Man! 365 marathons, 365 days! The man in the picture is a Belgian runner named Stefan Engels, from Ghent. He had a crazy idea – to get people interested in running, rather than “sitting in front of the TV with a bag of crisps (potato chips)”. He would do it by a dramatic Guiness Book of Records feat – run one marathon a day, EVERY day, every single day, rain or shine, for a whole year, 365 days. And despite injury, exhaustion, diarrhoea (in Mexico) and other problems, he succeeded. It was a tremendous triumph of will power. Once, Stefan had to do the marathon with a hand-cycle, because his legs were injured. But mostly, he ran, and once in a while, walked. Let’s do the numbers. 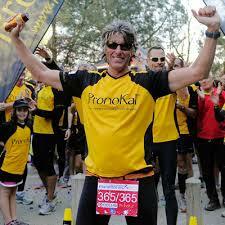 In all, over a year, he ran 9,563 miles or 15,330 kilometers. His usual pace was four hours, or 6.5 miles per hour (10.5 kilometers per hour). Stefan is bandy-legged – his legs turn inward. This should have led to serious injury, as the stress went up his legs into his back. But in general it did not. He runs very economically, with low leg lift, and very light footfall. A documentary about him, Marathon Man, tells the story. For those of us who have done ONE or TWO marathons in their lifetime, running one a day for a year is mind-boggling. Stefan – we salute you. Anything is possible, indeed. Jeanie Leung: Follow Your Passion! My last blog was posted Nov. 5, a very long (for me) 15-day silence, owing to travel, and difficulty in accessing Facebook and WordPress in Mainland China. Today my wife and I are in Hong Kong, at Hong Kong University of Science and Technologies, a truly great research university where I will give five lectures. HKUST is only 23 years old, founded in 1993, yet it is now ranked among the world’s top engineering and science universities, owing to clever innovative leadership. My friend Amylia took me on a tour of HKUST yesterday and by chance, in the library, we stumbled on an exhibition by an artist Jeanie Leung. (See her website: www.jeanieleung.com, and ‘like’ her on Facebook, Jeanie leung). Jeanie is an HKUST graduate with a BBA (Bachelor’s in Business Admnistration). She worked successfully in banking. 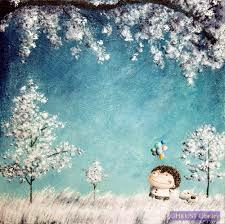 But her passion was art, even though she has never formally studied painting. One day, she quit her job, left the secure paycheck – and sent out on an adventure. She wrote a series of wonderful books, child-like in quality but with powerful serious messages, illustrated by her incredible acrylic-on-paper paintings. The series of four books is called Colours of Stories. Yesterday I met her in person at her exhibition and got her autograph. Jeanie typifies two key principles. One is: Follow your passion! She has, and has been eminently successful. The second is: Discovery and Delivery, you need both. She had a brilliant concept for her books. But she works exceptionally hard to implement them. She finishes a painting in 2-3 days, and it takes over 40 of them to make a book. From a video, it appears she works on the floor. HKUST is helping her market her books and is giving her moral support – despite her abandoning the business world for the world of art and books. Congratulations, Jeanie. I hope others will follow your example. IMF – Oops! We Got It Wrong! The International Monetary Fund (IMF) was invented at Bretton Woods, NH, in July 1944. It is headquartered in Washington, DC and its task is to bail out companies that get into financial trouble, overspending, overborrowing, etc. And this happens often. 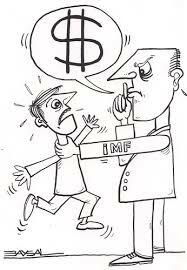 The IMF is an exemplary organization. It has among the world’s best economists (its former deputy director was Stan Fisher, formerly head of Israel’s Central Bank, now Vice Chair of the U.S. Fed), and it even has an independent evaluation board that checks whether it has acted correctly. Now, this independent board has reported that..the IMF erred. Ooops. Initially, when the global crisis broke out in 2007-8, the IMF recommended that governments support the economy, and indirectly its banks and financial institutions, by using fiscal policy, i.e. deficit spending. But then, the IMF switched direction, under pressure perhaps from capital markets, and said that governments should impose AUSTERITY, cut spending, cut borrowing. Bad idea. The independent IMF board said: the IMF erred. It recommended austerity too early. Perhaps, it should not have recommended austerity at all. It is sad when the world’s fireman, the world’s Mother Hen telling its chicks what the right thing to do is, admits it blundered. And sad when economics makes a mistake that is costly for hundreds of millions of people. It will be hard for even a serious body like the IMF to regain its credibility in future. Yesterday, Sunday, my wife and I visited Singapore’s remarkable Gardens of the World – domed gardens, showing the amazing flora and fauna of various regions of the world, including a man-made mountain with a walkway (that spiral trail you see is where you walk, viewing an incredible man-made waterfall). Singapore is only a small archipelago with some 5 million people. Yet it has higher GDP per capita, by some measures, than the U.S. It exports twice as much as its GDP. How? By value-added manufacturing – import components, assemble them, export them. 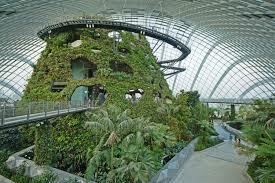 Singapore, the country, has exceptionally deep pockets, that enable it to afford such incredible structures as Garden of the World. Its Central Provident Fund is the repository for compulsory savings – about a sixth of every pay packet by the employee, and an equal payment by the employer. Singaporeans can draw on this not for consumption but for things like housing. So by law, Singapore’s personal saving rate is a third of national income. Singapore has a remarkable mindset. As a small country, in a neighborhood that is not always totally friendly to Singapore, it must be alacritous and resilient, to ‘remain relevant’, as a close friend from the Singaporean Foreign Ministry told me. To remain relevant as a small country, you have to be the best at everything you do. Singapore Airlines must have the most video movies of any airline and the best business class. Singapore itself must have attractions for tourists that surpass anything you can see elsewhere. Singapore has to be #1. No excuses. And that no excuse mindset creates remarkable excellence. Moreover, Gardens of the World has a strong message. Here is the full beauty of G-d’s world, laid out before you, flowers, plants, trees… and we are ruining it through climate change. Let’s take action. When you see the message vividly, first hand, in this manner, it is very powerful. Will our children and grandchildren see the world of beauty as we do? Or will it be gone, as will be the case if we continue to pollute our air and our water and our land.